Wheat Gemelli Pasta for sale. Buy online at Zingerman's Mail Order. Gourmet Gifts. Food Gifts. In the last 20 years there’s been huge growth in American artisan cheesemaking and bread baking, but there’s never been a great American dried pasta—until now. 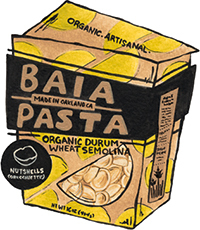 Out in Oakland, California, Baia is taking advantage of the fantastic organic flours grown in the US to create some equally fantastic pasta. Originally from the Piedmont of northern Italy, pasta maker Renato studied with the best pasta makers in Italy for years to learn the secrets of making great dried pasta. He and his partner Dario Barbone set up shop in Oakland and started making dried pasta for the Bay Area. They use traditional techniques, like extruding the pasta through brass dies (think Play-Doh maker and you've got the right idea) to give it a rough surface texture that’s ideal for sopping up sauce. They also dry the pasta slowly at low temperatures to develop flavor. The result is a toothsome pasta that tastes like fresh bread and contends with many great Italian pastas. Gemelli means "twins" in Italian. Each piece has two little twisted tubes of pasta curled around each other in bite-size bits. Elbow pasta is great for holding thicker sauces and meaty dishes, cold pasta dishes and of course, homemade mac-n-cheese.